It’s a dead-end conspiracy theory the Left has championed since Trump won the presidency. It’s born from illegal surveillance of Trump team members by the Obama administration. It is a political fishing expedition, made possible by secretive Foreign Intelligence Surveillance Act (FISA) warrants. It’s all rather hush hush. Warrants for surveillance are issued in secret by a secret court. They’re supposed to be against “foreign spies,” not Americans who happen to be in an opposing political party. FISA was created in 1978 to monitor intelligence information between foreign powers and agents of foreign powers suspected of espionage or terrorism. Today it is unethically, illegally and unconstitutionally used by one political party to gain advantage or decimate an opposing political party. FISA comes up for renewal Dec. 31. It should be allowed to die in Congress, never to rear its ugly head again. FISA has proven a boon to political shenanigans. What a great excuse to eavesdrop and embarrass Trump and his team before AND after the elections. Paul Manafort, Trump’s onetime campaign chairman, previously had business ties in Russia. He continues to be investigated over those ties. Great, let’s issue a FISA warrant on him, not because he is suspected of being a Russian agent, but to get political dirt on the Trump team. Then unmask names through leaks to cause as much damage and chaos as possible among the Trump staff. Obstruct. Resist. Create havoc. Is Carter Page, a foreign policy adviser to the Trump campaign, a mystery Russian agent just because he was a former investment banker in Moscow? The FBI and the Justice Department obtained a FISA warrant targeting Page’s communications. He has repeatedly denied any wrongdoing in his dealings with the Trump campaign or Russia. Page has never been accused of any crimes. The warrant is just another “legal avenue” with which to eavesdrop on the Trump staff. As we have seen, the program is fraught with political abuse on the part of Deep State operatives. Tell your representatives in Washington NOT to extend it. In fact, sign our petition to end FISA. CLICK HERE. It’s not just political movers and shakers. Your right to privacy is being threatened like never before. The NSA, CIA and other intelligence agencies of the United States are delving into your privacy — with FISA warrants, allowing for abusive spying on Americans. It is not legal and is an abuse of power. America’s entire surveillance apparatus, while much needed to keep the country out of harm’s way, is also being weaponized to profit one political party over another. This is dangerous and must be stopped. Surprisingly, the White House is going along with renewal of the FISA law, saying it is needed to protect national security. Within FISA is Section 702, which allows the collection of your data from Google, Facebook and other social media companies if a foreign target is under surveillance. But as Edward Snowden noted in 2013 when he blew the whistle on such collection data, everyday Americans had their information corralled. Our Constitutional-guaranteed privacy is being bulldozed. 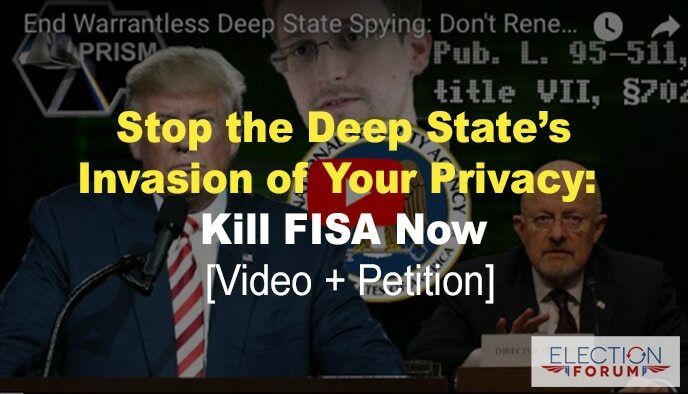 Watch this powerful 10-minute video on Deep State spying in America. Please CLICK HERE to sign our petition urging congress NOT to renew FISA. The Deep State is not a component of “the left,” but is the effective ‘enforcement branch’ of the same international establishment entity that in the U.S., is made up of establishment-democrats and their dialectical counterpart establishment-republican conservative impostors. The true 2-party system at odds with eachother is not democrat verses republican as the establishment media would have us believe. The true battle is between establishment-democrats joined with establishment-republican conservative-impostors infesting the GOP, against true GOP conservatives who are necessarily constitutionalists. If we continue failing to identify the establishment-republicans as conspiratorial counterparts to establishment-democrats, then the GOP will never be cleansed of its establishment infection during GOP primary elections. Residual Deep State operatives infesting government are not simply ‘Obama holdovers.’ They are mostly holdovers from establishment-pawn Pres. Obama, but also include holdovers from ‘Mr. New World Order’ establishment operator Pres. Bush. The establishment conservative-impostors infecting the GOP have for decades used ‘christian’ and ‘patriotic’ rhetoric as a veneer to hide their true nature. When establishment conservative-impostors atain both a GOP congressional majority and a GOP presidency simultaneously they turn back only a small percentage of the socialist/fascist/globalist governance previous democrat congressional majorities enacted – though far more constitutional restoration could have occurred. This establishment-GOP fake opposition to democrats is evidenced by establishment conservative-impostors House Speaker Ryan and Senate Majority Leader McConnell joining other establishment operatives in sabotaging the Trump’s presidency by allowing bogus Russia investigation’s, slow-walking legislation, and offering up fake ObamaCare repeal, and gun-control. If our church leadership does not begin fulfilling their biblical obligation to admonish their flocks of their obligation to represent Christ in government and society to the exclusion of evildoers and unconstitutional government, then we will be known before God as the lukewarm religious people having sacrificed our own children and grandchildren at the altar of our emotionalized, experiential, ‘works-phobic’ religion not finding Christ worth representing. James 2:17 – – Thus also faith by itself, if it does not have works, is dead. 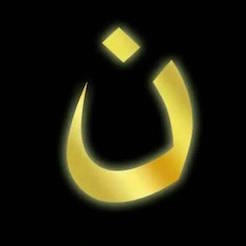 Revelation 3:16 – – So then, because you are lukewarm, and neither cold nor hot, I will vomit you out of My mouth. Few things reveal the deep-state-establishment’s frustration with Pres. Trump more than the speech recently given by our former ‘Globalist & Chief’ Bush Jr. – accompanied by his wife who after GW left office conveniently made known she is pro-abortion. And of course, in today’s World of Christian-relativism some claim she can be pro-abortion and Christian. We must contact our GOP deep-state-establishment House and Senate leadership demanding they stop pretending to support Trump while sabotaging him! I have repented before God for failing to represent Him in my own GOP party by allowing it to become the party of fake-conservatives, and have begun representing God at our County GOP meetings. That said, nobody should repent more than the pastor/priests of America who have participated in the evils destroying America by their silence. Why don’t these church leaders understand their obligation to remind their congregations of the Biblical requirement to preserve the blessing of America God bestowed upon us? They are supposed to be shepherds obligated to protect their sheep both spiritually and physically, not shepherds creating sheep fattened for deep-state-establishment globalist wolves to feast upon! Get ready for a fight within the GOP where establishment fake-conservatives and their unknowing-puppets attack and slander true conservatives trying to clean them out of the GOP. There are 2 opposing faction in the GOP. Those in leadership, most politicians and many well intended puppets of theirs who serve the deep-state-establishment, against those not doing the bidding of the deep-state-establishment. The deep-state-establishment’s tentacles reach far into corporate America, the Federal Reserve, the stock market, our intelligence agencies, courts, and more. Tactically, to maintain their stranglehold on the GOP, these deep-state-establishment deceivers must attack those speaking truth about their being in the same camp as establishment-democrats while posing as christians/conservatives. The godly enemy of the deep-state-establishment is true christianity and the true intent of our constitution. The corrupt portion of Republican Party has a lot in common with most of America’s Christian churches. The Republican Party has been corrupted to move away from the constitution, and all but a few churches have been corrupted to move away from teaching the word of God in its entirety. Most churches have great music, but edit the bible leaving out the portions requiring christian involvement in every aspect of society and government. And because christians have not obediently been representing Jesus in society and government, they left America left vulnerable to deep-state-establishment corruption. Respectfully demand your church leadership continually reminding attendees of their obligation to be ambassadors for Christ in government with a special focus on preventing corruption. Corruption including socialism, corporate-fascism (public/private partnerships) and globalism in government. There is no saving America from ruined with church leadership editing the bible by being silent in these matters, and without removing the deep-state-establishment’s control over the GOP.